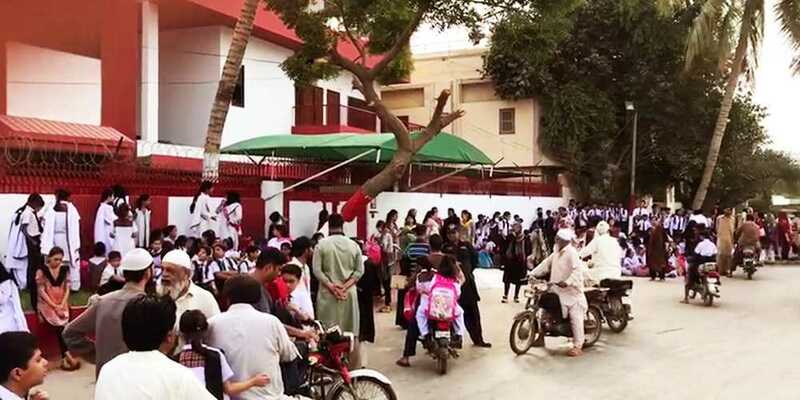 Sindh Building Control Authority (SBCA) sealed a private school in Gulshan-e-Iqbal area of Karachi on Thursday. Parents, teachers and students staged a protest outside the school premises when they found the school doors sealed upon coming to school in morning. According to reports, the school was operating in a residential area. It was built in violation of SDCA guidelines. School administration claims they were not given any warning notice by SDCA. Furthermore, there were other schools in the same area but none of them had been sealed. The school hosts around a hundred students. Earlier in February, the Supreme Court (SC) had expressed annoyance with Karachi Development Authority (KDA) for failing to clear illegal land encroachments in the city. According to KDA, thousands of square yards of 35,000 amenity plots had been taken over through ‘china cutting’ and land worth over Rs1 trillion was illegally occupied.